Click here for an updated version of the slide on this page. Note that people will move in and out of these categories over the life of a community. Interactions and knowledge flows between these constituencies create many opportunities for learning and are a sign of community health. Different types of participants in a community of practice have different perspectives, needs, and ambitions. When are different levels a problem? 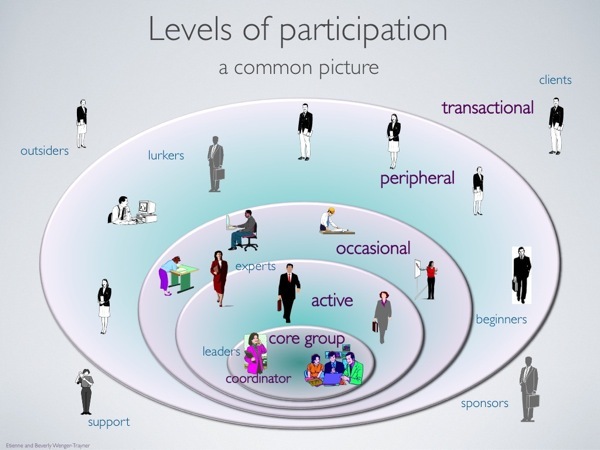 Usually, a layered structure with various levels of participation is not a problem. It is a natural state for a community. Still there are cases where this situation can be a red flag and require active intervention. It is often a problem when the distinction between levels of participation reflects a distinction that comes from outside the community. For instance, if the core group is entirely from headquarters and people in the field are peripheral participants, this is usually a situation that is going to require some corrective action, such as giving people in the field some active role in running the community. Another red flag is when there is no movement across levels, no one from the periphery moving in, the same old core group, or no new blood among active members. Again it may be useful to be proactive in inviting people in. Each community is unique, however, and needs to find its own balance among constituencies. On the one hand, peripheral members should not be marginalized; on the other, core members can be distracted and even overwhelmed by the demands of a wider periphery. Serving the dynamic mixture of these voices is a key part of the art of cultivating communities and networks. Conceptually, does the CoP core group inhance it’s impact on others…actives etc. by mere interaction or by deliberate consultation and invitation to engage in CoP activities? Hi Valetta… it’s a mixture of both. Ideally, you’d have a core group who are passionate about the domain and active – regardless of the impact they are having on others. Others would be contaminated by their excitement and the things they are doing and want “in”. In practice – just like in all relationships – crafting your invitation, telling the right story – in the right places – about what you are doing, designing activities that give high value for time (which needs some consultation), welcoming people in .. all those things will contribute to a vibrant community. * What level of participation should one expect? * What about tasks and expectations for a community of practice? Thanks for making this available guys! I have thought about this slide many times since the first time I saw it in a presentation Bev made for us back in 2009. I will be using it in my own presentation next month. I am hoping it will convince the ‘lurkers’ that they are important too! Very good picture and words to frame participation. Is there any publication with this content available? I could´t find it in COP, 1998. How might you describe the relationship between the “levels” described in this diagram and the levels/types of identity formation processes: imagination, participation, etc. described in your works elsewhere? Hmm, good question. It is true that engagement would be most associated with active participation, but so are imagination and alignment. So it is probably better not to look for a simple one-to-one relation.